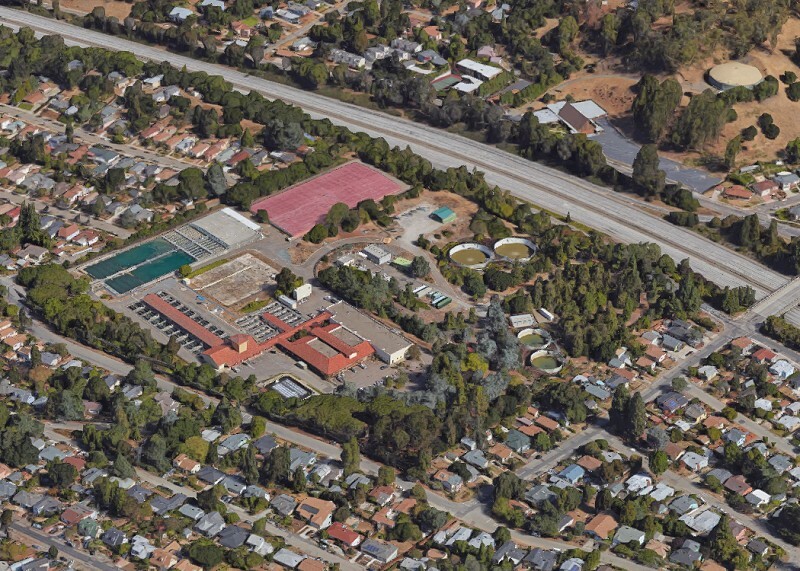 Next month, East Bay MUD will finish shutting down its 80-year-old Orinda water treatment plant for six months of rehabilitation. For the last few weeks, Oakland residents have been drinking water from our own local San Pablo and Upper San Leandro reservoirs. Consider this a once-in-a-lifetime opportunity to savor artisanal water from local watersheds. True, much of the water in these reservoirs is pumped there from our main source, the Mokelumne River in the Sierra Nevada. But just last week nearly two inches of rainfall fell on these watersheds. More will come. 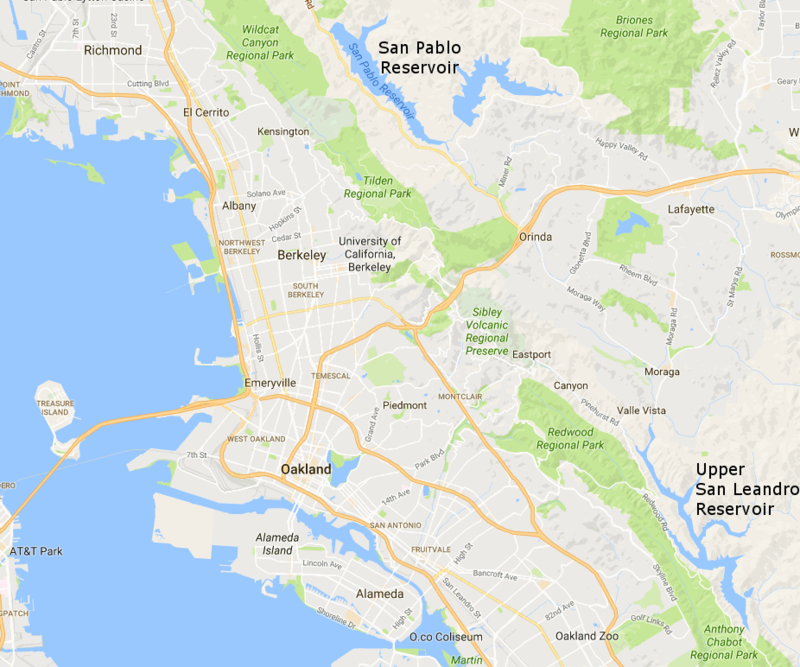 The water from Upper San Leandro Reservoir is piped through the hills to EBMUD’s treatment plant in Oakland just north of Keller Avenue and west of I-580, seen here in Google Maps. The San Pablo Reservoir serves a plant in El Sobrante. There the raw water undergoes a series of physical and chemical operations to make it safe and potable. This is the stage that they screwed up in Flint, Michigan, by changing the water source but not adjusting the treatment to the new water. We treat water as a utility that comes out of faucets, but water’s not like electricity — it’s a varying natural product that needs constant, professional attention. All water starts out wild. Even after treatment, water changes its taste from time to time. It’s always healthy, though, especially compared to raw water. Think of the next few months as a visit to the past. A hundred years ago Oaklanders were getting their water from local wells, local water companies, or Lake Temescal (1868) and Lake Chabot (1870), two impoundments created by Anthony Chabot to support the growing city. The water was purified with simpler methods including sand filtration. The San Pablo (1919) and Upper San Leandro reservoirs (1926) were the first new surface storage built in generations, and this winter we’ll be relying on them as mainstays. Follow your reservoirs every day on the EBMUD site. This post about Oakland groundwater got a long, productive set of comments. This entry was posted on 24 October 2016 at 8:03 am and is filed under Oakland streams and water. You can follow any responses to this entry through the RSS 2.0 feed. You can skip to the end and leave a response. Pinging is currently not allowed. I never treasured our water more than my freshman year at UC DAVIS when the water from the faucets smelled and tasted so awful (with weird semi-translucent particles suspended in it). Did not realize how good we had it. I lived in Orinda and Moraga back then (early 80’s) and now live in Albany. Have noticed a bit difference in taste last few week so I suspect us in Albany are affected as well. Still better than most.